Amazing Glass Artist...his Work Looks Like Magic! Weekend Find - Giant Banded Opaque/translucent! 2 1/8"
Very nice find! Very rare in is size. My largest banded opaque is 2-3/8" but has several large chips. It has red and blue bands and loops on a white translucent base. This is without a doubt a very early antique handmade German marble, you can tell by the highly facetted pontil. I have a fused cane marble with 3 swirls canes fused lengthwise, one divided core and 2 solid cores. This is the only fused cane onionskin I have seen so far. Woooooooooow! That's fantastic! 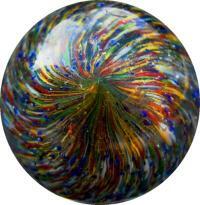 One of the best marbles I have ever seen. Lucky you! A friend of mine bought this marble and the surface is all original. It has one tiny chip near the pontil and a few scratches, the rest of the surface is mint. He send me a better pic of the pontil. Yes. This marbe looks like a remelt. The blue/white looped opaque in the back on the right is German. Similar marbles have been dug in Lauscha. And I have found several Lightning strikes here in Europe. A friend of mine found over 25 in Denmark....so not sure they were made in China. That marble was made in Portugal in the 1920's. Yes, they also made some pretty nice handmade marbles there!